A man of culture living at Damascus and Safed between 1473 and 1485. He was the author of a commentary on some parts of Maimonides' Yad ha-Ḥazaḳah, and copied the commentary of an Arabian writer on the first philosophical sections of that work. He also edited an Arabic commentary on the Pentateuch, of which only fragments are now extant, and composed philosophical hymns in Arabic and Hebrew. In 1451 he copied at Aden the dictionary of Tanḥuma. 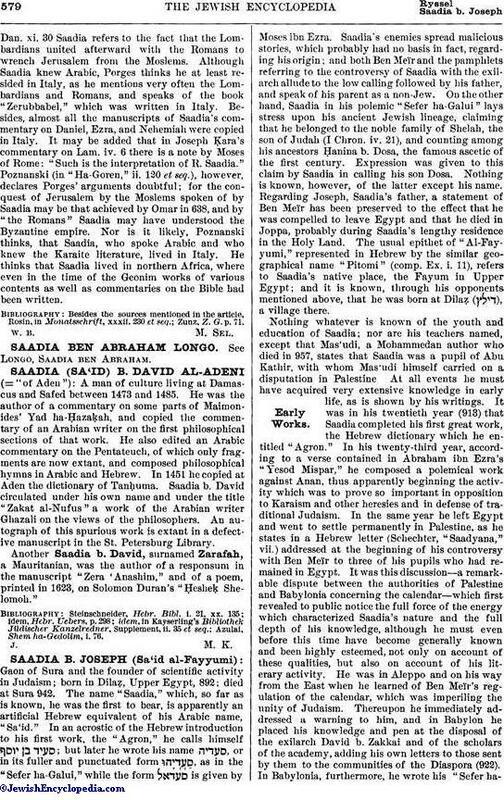 Saadia b. David circulated under his own name and under the title "Zakat al-Nufus" a work of the Arabian writer Ghazali on the views of the philosophers. An autograph of this spurious work is extant in a defective manuscript in the St. Petersburg Library. Another Saadia b. David, surnamed Zarafah, a Mauritanian, was the author of a responsum in the manuscript "Zera 'Anashim," and of a poem, printed in 1623, on Solomon Duran's "Ḥesheḳ Shelomoh." Azulai, Shem, ha-Gedolim, i. 76.